Ohmygoshohmygoshohmygosh! Can you believe we’re about to finish our lovely little summer shirt? I have had so much fun knitting up this cute little Guildenstern top; I hope you have, too! So, let’s get down to it so we can start wearing it and showing off to the Muggles! Side Seams? Who needs ‘em!? If you’re reading through the pattern and notice that I haven’t said anything to date about the Side Seams section, it’s because we won’t need to work them! Since we worked the Body of the sweater in the round until we divided for the armholes, that section is negated. So, yay! We get to move right on to the Sleeve Edging section! WOO! THE SIDE SEAMS ARE ALREADY DONE! Sleeve Edging - Pick It Up! we pick up fewer stitches than there are rows to avoid puckering! 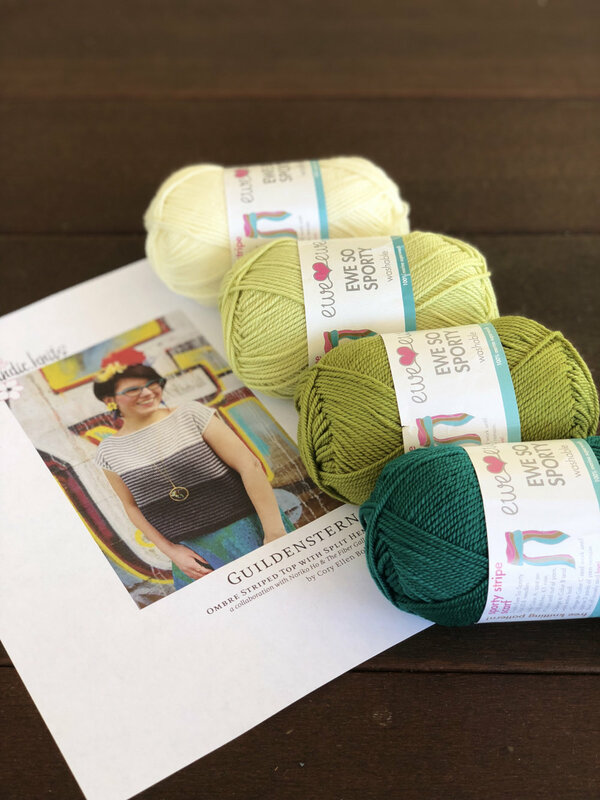 Since our stitches are so tiny, I’m going to route you over to a fabulous blog post that Heather wrote a little while ago when she hosted a Carbeth knit along. She used a nice bulky weight yarn so you’ll be able to see her stitches very clearly! 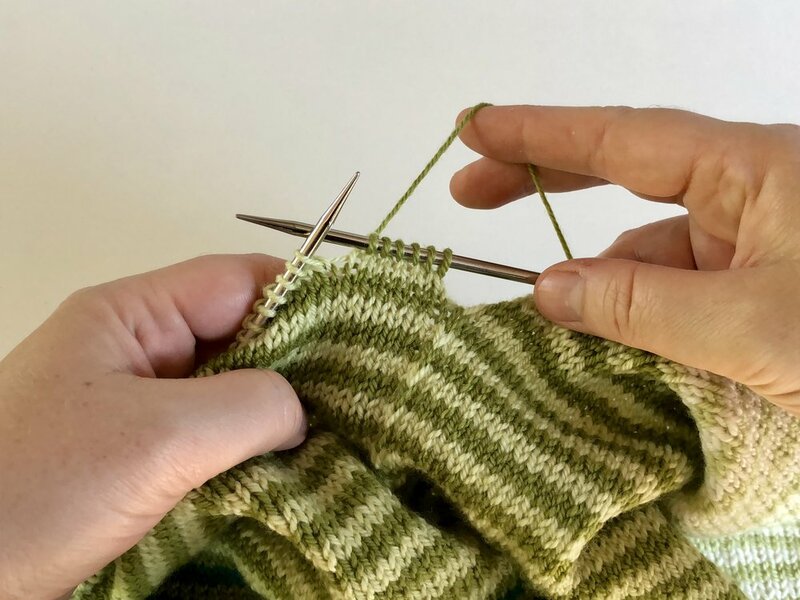 While we aren’t picking up for a front of sweater button band, the exact same principles apply: we want to pick up stitches with the RS of our work facing us so that the pick-up seam ends up on the inside of the sweater, and we want to pick up at a ratio of 3 sts to 4 rows of knitting. Our exact number of stitches doesn’t matter since we aren’t working in a ribbed pattern, we just want to be sure that the number is the same between the two sleeves. Be sure to count the number you pick up when you work the first sleeve so that the second sleeve matches! VISIT HEATHER’S BLOG POST BY CLICKING HERE! Once you have all of your lovely little stitches picked up for the sleeve, whether you use Magic Loop or DPNs (or heck, even 2 circulars, however you prefer to work small circumference knitting) it’s smooth sailing to the end. Just two quick rows of garter before binding off purlwise. When binding off, I recommend going up a needle size or two unless you know you have a loose-ish bind off tension. If you work the bind off too tightly you could get some minor puckering, so stay loose on this one! When the sleeves are all done, take the time to weave in your ends! I find it useful to weave everything in but not trimming the tails. If there’s any stretching that goes on during the blocking garment, you don’t want a trimmed tail coming loose which could mean you end up with tiny ends poking out everywhere. So, how many of you tried on your Guildenstern like 8 times before you even blocked it? No? No one? Just me… ok…. As I was admiring my handiwork, I noticed that the armholes definitely tried to roll inwards despite the sleeve edging. That’s the nature of stockinette, baby! It’s gonna curl. Which is why blocking this out is so important! Once again, I get to refer you to a blog post that Heather wrote about the steps needed to block a garment. It’s a great visual step by step to get you going if you’re new to blocking. 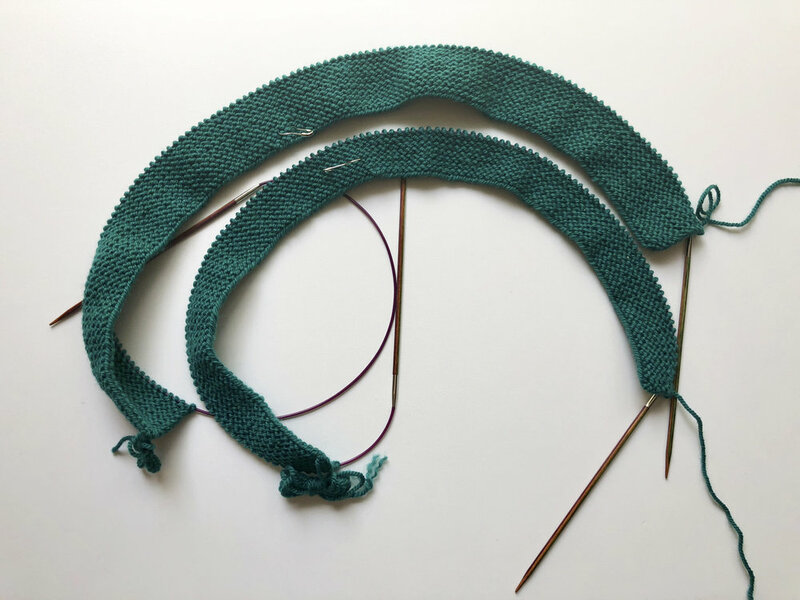 VISIT HEATHER’S FABULOUS BLOG POST ON BLOCKING! What I will add to Heather’s post is specific to the Guildenstern. I’m not a big fan of pinning out sweaters when they block, as you’ll note that Heather didn’t with her sweater either. BUT! Since so much of this Guildenstern garment relies on straight lines, I decided to buckle down and block out my edges to they’d be nice and crisp. Why don’t I like to pin? Well, because the first time you block a sweater is the way in which you should wash/block it on all future cleanings/dryings. So, the least amount of work I have to do with a garment on subsequent washings the better. But I reiterate, with the Guildenstern, it’s totally worth it to have clean, crisp edges to my sleeves, neckline and bottom hems. What to pin, what not to pin, that is the question! As I might have said ad nauseam above, I don’t like to pin garments. But when I do, I’m particular. I don’t want to pin more than I have to so I focus on what’s important. For this garment it’s the sleeves, hems and neckline. Here’s how I went about it after completing the soaking and rolling aspects of the blocking process from Heather’s blog post. BLOCKING OUTSIDE IN THE SUMMER HEAT WILL HELP THIS DRY FAST! Step 1: I used a blocking wire and placed it along the neckline/sleeves inside the garment so I had a nice straight edge to work with. Step 2: Using T-pins, I pinned the neckline (both the Front and Back layers) just below the blocking wire so that they’re all pinned to the same height. I highly recommend using a pin every ½ to 1 inch so you don’t get scalloped edges. Step 3: I used blocking combs (thought you could totally use T-pins if you don’t have combs) to pin out the edges of the sleeves. I used my ruler to measure out the width of the garment as per the schematic on page 2 of the pattern. Step 4: I used blocking combs again (and some T-pins since I ran out of combs) to pin out the two bottom hems). In this instance, I recommend pinning out the Back hem first and then the Front so you don’t pull any stitches. I didn’t bother pinning out the sides. I could have, I suppose, used some blocking wires run vertically up the side seams but it didn’t seem worth the effort. That’s it, folks! Once this baby dries (and mine did in less than 3 hours because it was 95 degrees in my yard) you just have to trim the ends from your woven-in ends and start showing off your handy-work. We would love to see your finished garments! Heather and Meaghan are still here to answer any questions you might have about finishing up the Guildenstern shirt. When you’re done, be sure to share yours online on Instagram with the hashtags #DoubleTheFunKAL and #EweEweKAL. Follow @eweeweyarns and @notsorryknitter on Instagram now! As I mentioned last week, if you’re not all caught up on your striping, it’s ok! This week is a bit of a light week since I know how things can build up and we get behind. This week we’re going to work the Neckline and Shoulders. Easy peasy! I found it easier to just work the Back first since it’s already on the needles from last week. If you prefer to work the Front first, that’s a-ok since they’re worked in exactly the same manner. Since we didn’t break our Color D yarn from last week we’re all ready to go with the RS of the Back. Grab your Smaller needle and knit 3 rows. To clarify, we’re now working in garter: knit 1 RS row, knit 1 WS row and knit 1 more RS row! Now, with the WS facing we’re going to work the Bind Off row that will create the neckline. We are knitting and binding off knitwise to maintain the garter ridges for a nice neckline detail. Knit the number of stitches as per the pattern and then work a kfb. This KFB (knit into the front and back creating a new stitch) is my FAVORITE technique when binding off for a raw neckline like the Guildenstern has. This new stitch that we create will be the setup stitch to begin binding off. When you create the new stitch in the kfb, you also avoid the weird stitch distortion that inevitably happens when you bind off mid-row. It’s super dee-duper awesome. The pattern says to “BO (bind off) knitwise until X number of sts remain”. The thing you want to keep in mind is that the “X” number of sts is the number remaining on the left hand (LH) needle. On my size I knit 32 sts before working the kfb. The “kfb” created a new stitch on my right hand (RH) needle. Once I bound off my first stitch using the newly created stitch of the kfb, I had 33 sts on my RH needle. SO! When I’m binding off, I want to bind off until I have 32 sts on my LH needle. There will still be one stitch on your RH needle so that you’ll have a total of 33 once you knit to the end of the row. Clear as mud? It will be super clear once you start working the bind off. When you are done working the bind off row, the pattern says to measure out 5 yds. You don’t need that much for the Shoulders. I recommend measuring our 2 yards, MAXIMUM, to work the shoulders (I used just over 1 yard but I never want you to be short). You can then Break Color D and move on to the Front Neckline. Work the Front Neckline in exactly the same manner as above. When you break Color D, measure out the same yardage (approximately 2 yds) for the Shoulder. 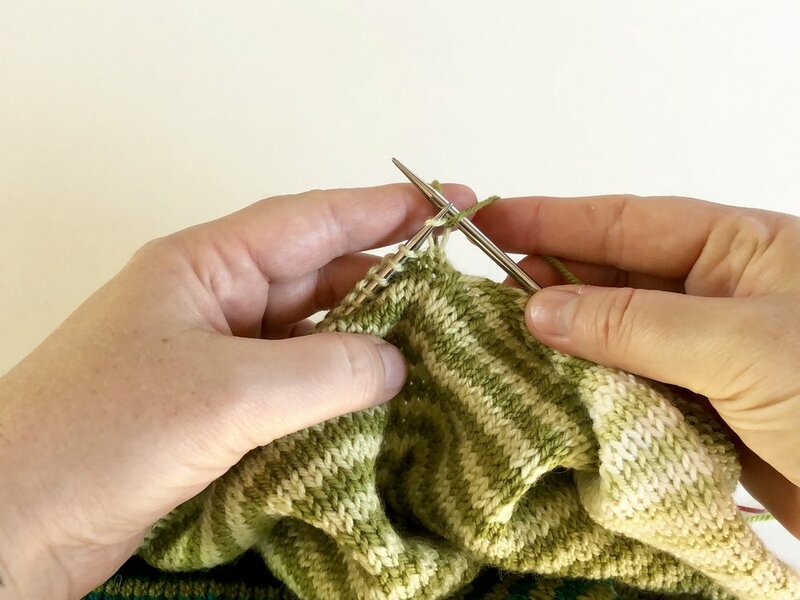 The shoulders are “bound off” using a 3-needle bind off which is both a bind off method and a grafting method all rolled into one. It’s a really slick way of finishing a shoulder with a strong seam so the shoulder won’t stretch with wear. We’ll start with the Right Shoulder just because but they’re both worked in exactly the same manner. Step 1: Place the stitches from the Front and Back right shoulders onto two Smaller needles. Turn the project inside out so that the Front and Back shoulders are parallel to one another on the two needles with the WS facing outwards (the purl side will be visible). The working yarn will be attached to the first stitch on the back needle (see image below). Step 2: Grab a third needle of the same size (a DPN is really great for this). Insert this needle into the front (knitwise) of the first stitch on the Front needle and the first stitch on the Back needle. Step 3: Knit these two stitches together like a k2tog. 1 stitch will now be on your RH needle. Step 4: Insert your needle into the first stitch on the Front and Back needles (like step 2). Knit these two stitches together like a k2tog (like Step 3). There will now be 2 stitches on your RH needle. Step 5: Using one of the two needles in your left hand, pull the first stitch on the RH needle over the second stitch (binding off 1 stitch). 1 stitch will remain on your RH needle. Repeat Steps 4 and 5 until 1 stitch remains on the RH needle (no stitches on the LH needle). You will notice what looks like a braid forming where you have bound off your stitches. Once all the stitches are bound off and only 1 stitch remains on the RH needle, break the yarn and pull the tail through to close up the final stitch. Work the second shoulder in exactly the same manner! The goal this week is to get all caught up from Week 3 where we worked Stripe Sections 2 and 3 and divided for the armholes. Additionally, let’s get those shoulders finished! Once both shoulders are complete you can break the yarn and try your sweater on! Next week we’ll focus on working the armholes and blocking so you can show off your new summer sweater!